TD_Audio unleashes Melbourne Bounce, a rip-roaring pack that brings Melbourne’s energized underground club scene straight to your DAW. This pack comes amped with 5 Construction Kits, each containing a unique demo track and all its Audio components. You’ll find a tight supply of filthy Bass Loops, hard-hitting Drum Loops, piercing Oneshots, bent FX Loops, and wiggly Leads—all you need to get a track bouncing till daybreak. Each kit ups the ante with two Spire Presets, 1 NI Battery 4 kit and enough MIDI files to get your bounce on. Pumped up and tranced out, these raucous kits up the booty-shaking potential of productions in EDM, Big Room, Electro, House, and all club-style Dance music. Sounds are delivered in ear-melting 24-bit, 44.1 kHz Wav Audio, and each file is tempo-marked and keyed for instant easy use. 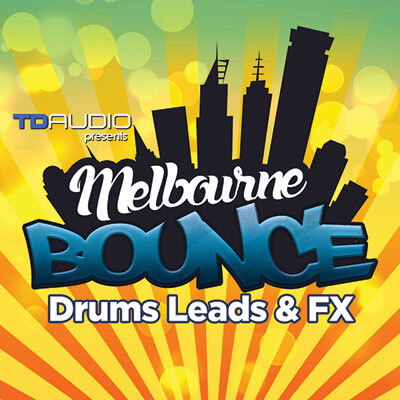 Melbourne Bounce was produced by TD_Audio, the powerhouse team of Twisted Reaction(Function Loops Label Group) and Lenny Dee (Industrial Strength Samples), two tenacious names in modern sound design. Combining cutting-edge gear with meticulous engineering and production, TD_Audio creates upfront production packs and kits at the frontline of dance music. Wrap your ears around the sound from Down Under—and infuse your tracks with the undeniable electric sass of the Melbourne Bounce.